Calling it part of their "2018 Cupcake Craze program," Hostess rolls out three limited-time Cupcakes flavors: Mint Chocolate, Strawberry, and Sea Salt Caramel. Mint Chocolate Cupcakes feature a frosted chocolate cupcake with mint creme filling. Strawberry Cupcakes are frosted strawberry cupcakes with creme filling. Sea Salt Caramel Cupcakes consist of caramel-iced yellow cupcakes with sea salt topping and a caramel creme filling. Each comes in a 12.7-oz box of eight individually-wrapped cupcakes and are sold nationwide. 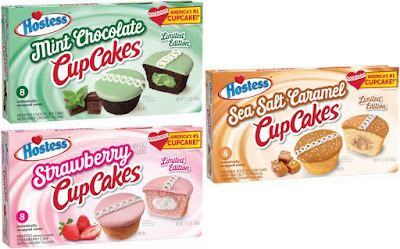 Photos via Hostess Brands, LLC.